Our air bearings can be used alone or in combination to easily integrate into your current process. When designing a solution with air bearings, care must be taken to create an arrangement that correctly constrains motion based upon the needs of the application. Since air bearings create a floating body, that body must be constrained in space, in order to perform in the desired axis. Often, a feature can be incorporated on the guide surface to constrain motion to the desired axis. Numerous other permutations and arrangements can also be utilized. You’ll find more specific information about these applications below. Round pucks and rectangular bearings are available from stock in a range of common sizes, allowing for any number of detailed arrangements. 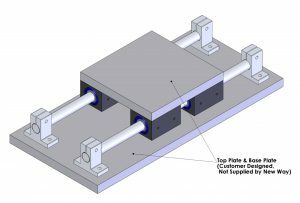 Since New Way Air Bearings are easy to incorporate into established systems, linear motion solutions can often be fabricated far less expensively than off-the-shelf assemblies. These air bearings are easily adjusted, can obtain high speeds and accelerations, have quick settling times, and superior accuracy in fly height control. This allows for superbly consistent motion and repeatability that is easily configured to your desired need. New Way’s Flat Round and Rectangular Air Bearings float on a 5µm layer of air, creating truly non-contact motion that has virtually zero friction. This requires that the flatness of the guide surface be greater than 50% of the fly height of the bearing. This is not as difficult as it may seem since many common applications involve the use of granite plates or blocks which are readily available from suppliers. 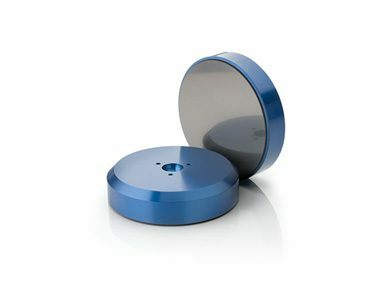 Other viable surfaces include hard-coated aluminum, ceramics, stainless steel, and even glass. Because the air bearings are non-contact, they average any surface deviations out, improving linear motion even further. Also, since there is zero friction, motion control resolution is nearly infinite, since the coefficient-of-static-friction is zero. Our flat round air bearings were originally designed for use in coordinate measuring machines and have since been used in a variety of applications such as robotic spacecraft simulations and roundness checkers. One of the most common permutations of our flat air bearings is the use of Vacuum Preloaded Bearings (VPLs,) especially where pre-loading is difficult or impossible. These flat round components use a vacuum to pre-load the bearing. 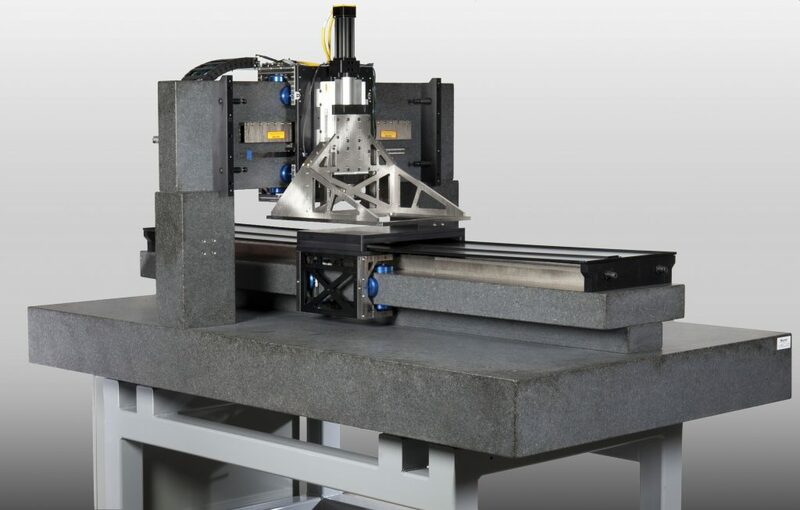 By adjusting the vacuum and pressure, the fly height and stiffness can be optimized. The result is that only one flat guide surface is necessary instead of two flat guide surfaces that are parallel as in opposed bearing preloading. When the need for low coefficients of friction and high motion control resolution on rail type systems is required, then you should consider New Way Air Bushings. These bushings are available in a range of sizes from 13 mm to 75mm, and in English sizes from ¼” to 3.00″, allowing for common shaft size mounting. Since 0.4mm (16µ in) surface finish shafting is commonly available, creating precision single axis linear motion is easy. By utilizing a tube of porous media, in which there are millions of sub-micron holes, and applying an air pressure of 60PSI (0.4 MPA,) an 8 µm (0.0004″) layer of air is created between the bushing and shaft. The bushing is designed so that a self-centering force is created by the air flow, allowing for true 360° non-contact motion on round shafting. Coupling two bushings around two parallel shafts creates precise motion along one axis, and eliminates the heat and vibration commonly associated with roller contact or recirculating ball linear guide systems. 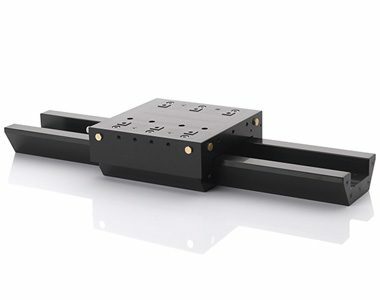 This arrangement provides micro resolution positioning which allows for precision applications previously unattainable using rail mounted stages. New Way also offers four different types of standard slide assemblies, which combine an accurate guide surface with an air slide ready-fit for installation. This provides the user with the convenience of an integrated guide and bearing system. With our dovetail, end-supported and boxway slides, along with our AirWay® linear motion guide system, you’re sure to find a slide that fits your specific linear motion application. 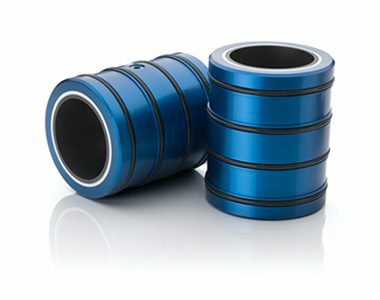 These slides have a straightness of motion and dynamic response often an order of magnitude better than conventional rolling element bearings. 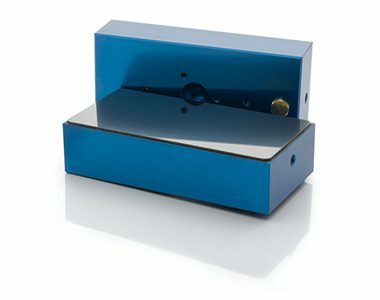 New Way end supported air slides, dovetail slides, and boxway slides provide local straightness (in X and Z) of 250 nanometers per 25mm travel (10 microinches per inch) and a maximum global error of 2 microns per 1000mm travel (80 microinches per yard). For further assistance with linear motion applications, please refer to the New Way Air Bearing Application and Design Guide or contact our Application Engineers 24/7 to discuss your specific needs.